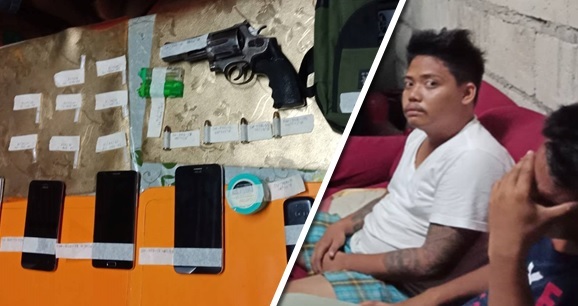 A 30-year-old man was arrested after police operatives allegedly found packets of shabu and an unlicensed firearm inside his home in Barangay Dela Paz, Cortes during a raid at 12:45 a.m. on Monday. Police allegedly found eight packets of shabu and a .357 revolver which were kept in a belt bag inside the home of Jeferson Bolanio. The seized drugs were estimated to be worth P8,000 while the pistol was loaded with four live rounds, police said. The operatives arrested Bolanio and also rounded up four of his companions including a barangay councilor. Police however did not identify the other men as they were still conducting investigations and determining whether or not charges will also be filed against them. Bolanio and his companions were reportedly drinking inside the house and were not engaging in illegal activities during the raid. According to Cortes police chief Insp. Camilo Estrera, Jr. Bolanio previously surrendered under Oplan Tokhang but continued involvement in illegal drug activities. This prompted police to place Bolanio under surveillance and set up the raid. Bolanio remained under Cortes police custody as authorities prepared to file charges against him for violations of Section 11 of R.A. 9165 or the Comprehensive Dangerous Drugs Act of 2002 and R.A. No. 10591 or the Comprehensive Firearms and Ammunition Act of 2013.